Being retired now, I cook most of the meals in our home. And of late I have become a connoisseur of my wife’s responses, spoken and unspoken, to what I put on our table. Let us say that tonight’s menu is Rotini with Lemon-Asparagus Sauce, a side of cooked carrots, and a Martha’s Vineyard salad. After a few bites, Robin may comment on what she has just eaten, or she may not. If she is silent for very long, I begin to get curious. “How do you like it?” I venture to inquire. “It’s good,” she reassures me. But her real meaning, I’ve come to realize, resides in her inflection. If the sauce is dry or a bit salty, “good” will take on a rising, tentative intonation, as if another verbal shoe were about to drop. If the sauce is indeed good, as opposed to bad, the word will have an affirmative but faintly impatient tone, as if to say, “Why wouldn’t it be?” But if, as occasionally happens, I have outdone myself, “good” will be accompanied or replaced by “delicious,” “scrumptious,” or even “bellisimo!” At that point I will surmise that all is well, though in her own words Robin has “never been partial to cooked carrots,” and at the end of the meal, a discreet pile of those little orange offenders remains on her plate. 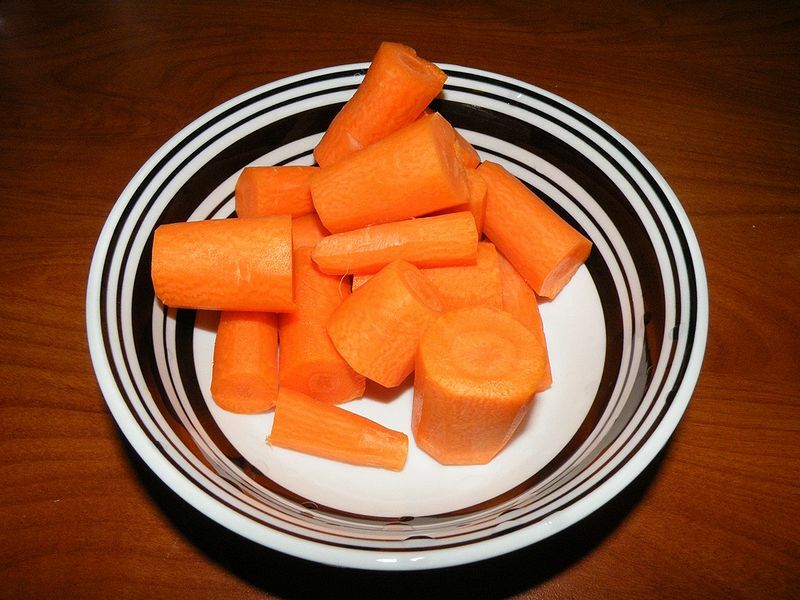 For better or worse, I am myself partial to cooked carrots and could eat them every other night. (To which Robin might add, “and we do”). Unlike Robin, who hails from Brooklyn, I grew up in the American heartland—eastern Iowa, to be exact. And a staple of our Sunday dinners was a portion of soft, cooked carrots, bathed in the juices of thoroughly cooked roast beef. As a grade-school child I grew my own carrots in my parents’ backyard garden, and I fondly remember sinking my father’s garden fork into the moist black loam of eastern Iowa. Even now, as I chop carrots into quarter-inch rounds or reduce them to matchsticks for Pasta Primavera, I recall their role in our family dinners and their place in my earliest experience. Much of that experience is foreign to Robin, as much of hers is to me. And so are the vernaculars in which we, as children and young adults, were deeply immersed. Such delectable words as tschotske (pron. CHOCH-kah, meaning “curio,” decorative object), schmata (rag; inferior piece of clothing), bubala (a term of endearment, sometimes applied to spouses), meshugana (crazy, a crazy person; also applied to spouses), and oy, gevalt! (good grief! ), all of which Robin might utter in the course of a day, were never heard in my family home—or for that matter in the entire State of Iowa. Long ago I abandoned any attempt to employ such words in conversation, lest I make myself a laughingstock. To speak Yiddish properly, not to mention expressively, requires a range of inflections and a repertoire of gestures well beyond the range of a plain-spoken, reticent Midwesterner. Such differences of upbringing, taste, language, and temperament are of course the stuff of marriage, and if conjugal harmony is one’s goal, it is essential to recognize, respect, and if possible understand them. And toward that end, Zen meditation can help. Zen is often thought of as a solitary endeavor, and in several, obvious ways it is, but Zen meditation can also support harmonious interaction with other people, especially those with whom we live. One of my fellow practitioners, who has been married for thirty years, notes that belonging to a practice group gets him out of the house one night a week, which is probably good for his marriage. More seriously, as the Venerable Thich Nhat Hanh has often observed, the practice of mindfulness trains us to be wholly present, not only for ourselves but also for our spouses, children, and other members of our families. At its most effective, meditative practice fosters one-pointed listening and a moment-by-moment awareness of how the other person, be it wife or son or daughter, is responding to what we say or do. And over time, such awareness can transform us into better—or at least less annoying—spouses, partners, and parents, who at long last understand what to say and not to say, and when it is best to say nothing. Perhaps with luck and continuing effort, the practice of Zen may also turn a garden-variety cook into a passable family chef, who knows more often than not what his wife desires. Ah, I remember carrots in roast beef juices. Have you cooked it that was for your wife? And, even though I am a Massachusetts girl (now living in the UK): Martha’s Vineyard salad? Great post!